Fusarium head blight (FHB) is a crop infection that has traditionally been found in Manitoba. Over the past three years, it has begun to spread and is moving west through the prairies. According to the Saskatchewan Ministry of Agriculture, FHB was found in 98 percent of wheat and 97 percent of durum samples in 2016 (Fusarium Management Guide). The Flaman Grain Cleaning team travelled to Melfort, Saskatchewan to take part in a Fusarium Management workshop presented by NARF at the Canadian Ag Research Farm. Here are the top 6 things you need to know in order to manage the disease and get the most out of your fusarium-infected grain. 1. What’s so bad about fusarium head blight? There are around 17 different strains of fusarium, but fusarium graminearum is the most common form of FHB that is causing downgrades growers' grain. The fungus causes a by-product, which is known as vomitoxin (VOMI). DON is a particularly nasty type of VOMI that poisons grain. Once infected, only a certain percentage of VOMI in your grain is acceptable for animal consumption. 2. Once you see signs of fusarium head blight, it's too late. If you don't know much about fusarium, you're not alone. Most producers aren't aware of the catastrophic damage an infection can do to their crop until it's too late. Once you see traces of fusarium in your crop it will reduce your ability to sell the grain and affect the growth of new seedlings. In extreme cases fusarium will decimate an entire crop. At the fusarium management workshop, the team learned there is no quick solution to eliminate fusarium from your grain. However there are ways to mitigate the damage so that you can make the most of your yield. 3. Three key areas of fusarium management on your farm. Host crop: Breed your grain for resistance, or select a less susceptible crop such as barley and oats. Pathogens: Fusarium sits in the soil waiting to attack. Environment: It spreads quickest during the flowering stage with a combination of warm wind and moist weather. 4. When is the best time to spray for fusarium head blight? According to Stu Brandt from Northeast Agriculture Research Foundation, the best and most effective defence is to time your fungicide application to coincide with the heading stage of the plant. Prevention is difficult to guarantee. One idea is to stagger times for seeding, so that flowering doesn't happen all at once. 5. Managing fusarium head blight infections the right way. Fusarium can't be prevented, it can only be managed. Rex Newkirk from the University of Saskatchewan says that accurate testing of the level of Vomitoxin (DON) is what should really matter the most to you, as a grower. Andrew Taylor started specializing in removing VOMI from fusarium-infected crops at the end of 2016. He says, "The BoMill does its job. It's an interesting machine to run. It's loud, but it works." He says he plans to pass on the advice about disease management to his customers, "I heard a few things about fungicide application being effective, you've got to get good coverage of kernels, and be aware of wet weather." Once your grain crop has been infected a crop rotation that includes mostly pulse crops is recommended for four to five years according to Gurcharn Brar, a biology researcher of FHB at the University of Saskatchewan. 6. Flaman Grain Cleaning can help you sort fusarium head blight out of your crop. Fusarium head blight is a broad disease and should be cleaned in the proper manner to give you the best results. Once you have analyzed a sample of your grain with vomitoxin testing equipment, you will have an economic decision to make. Either you will decide to clean it, dump it, or sell it as feed depending on the percentage of good quality kernels left behind. Visually sorting fusarium damaged kernels (FDK) by the physical characteristics to a predetermined percentage (usually under 5%). Internally sorting (via NIT infrared) vomitoxin (DON) to less than 2 parts per million (PPM). Once you know how fusarium head blight has affected your crop, Flaman's Grain Cleaning division can help you separate the infected kernels to recover the quality grain and save a percentage of your yield. They have several machines capable of cleaning fusarium and DON management including the ISM 40, BoMill Lab iQ, and FMS-2000. Taylor found that every crop is different when using the BoMill to clean grain for his customers. He says, "Some go from four PPM VOMI to under two PPM, and some that start at three PPM won't drop at all. It just depends on how hard the crop was hit." PLUS! Bring your Grain Samples and have it cleaned and tested! If you have a sample of grain (minimum two, 5 Gallon pails) bring it and have it tested for vomi-levels before, cleaned, and tested after so you can see in live action how you are able to Improve the Grade of your grain this harvest. Machines will be on site complete with staff to operate them and explain how it works. Everyone is welcome and it’s completely FREE! Pre-registration is requested to ensure enough chairs and space is made available. Just click here to send in your name, email, and how many people are attending (don’t forget to count yourself). In addition to Tuesday’s Fusarium day, Melfort Research Farms is hosting a second Field day the following day, Wednesday July 26th 2017. You can use the same registration link to sign up for Tuesday, Wednesday, or both days. With fusarium graminearum and its toxic vomitoxin sidekick deoxynivalenol (DON) stealing potentially hundreds of millions of dollars a year from Canadian farm revenues, the thought of paying toll processors to clean up commercial grain deliveries is gaining momentum. Spectrum Grain Solutions, located in Bashaw, Alberta, has purchased a BoMill TriQ grain sorter that has been installed in Kenaston, Sk. The Swedish-made BoMill TriQ has the capabilities to sort grain based on the interior make-up of each kernel, rather than the exterior appearance. It uses NIT (Near Infrared Transmission) technology to analyze each kernel and thus can sort grain based on fusarium, protein, vitreousness, seed quality and falling number at a speed of 25,000 kernels per second. For a full article click here. Learn more about the new technology in BoMill products on our Flaman Grain Cleaning website. I have downloaded data from Statistics Canada and created charts (below) for acres seeded to give some historical perspective. The first is for major crops in Saskatchewan only, the 2nd and 3rd are for AB SK and MB, with the first being major crops and the 2nd being secondary crops. 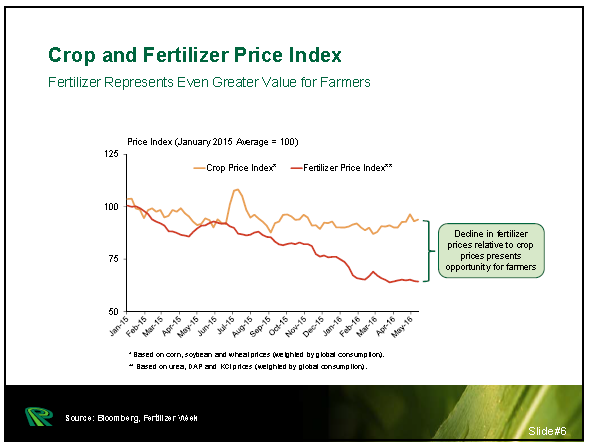 Fertilizer prices will likely decline in the short-term then grow in the long term. So ‘yes,’ buying a big bin now and filling it makes sense. First of all, what proof of a price decline is there? The downtrend is highlighted by a recent potash sale to India by Belarus (one of the very few potash producers) at the lowest prices seen in over a decade; about a third less than last year’s level as global supplies of the crop nutrient exceed demand. About the deal - one of India’s biggest fertilizer importers, Indian Potash Ltd. (IPL), will buy 700,000 tonnes of potash at $227 (U.S.) per tonne on a cost and freight (CFR) basis. Belarus’ contract price is likely to become the benchmark for other suppliers to India, such as Russia’s Uralkali and North American trading group Canpotex Ltd., owned by Potash Corp, Mosaic, and Agrium. For background see this story. The underlying thing from this is, China usually sets the floor or lowest global price for potash with their purchasing, so given the bigger annual’ish China deal is still outstanding, prices will likely decline even further. India and China, the world’s biggest fertilizer consumers, usually sign contracts earlier in the year. This year, deals were delayed as high stocks held by farmers meant there was no rush to agree a deal. India’s deal is a rare instance of the country signing a potash supply contract with a major producer before China. For more information, see this story. But then, on the upside, Belarus and Uralkali (the Russians) are looking at working together again on potash marketing , thus ending the price war that has driven down the price of potash. These two and Canpotex (PotashCorp, Agrium, and Mosaic) basically dominate the world potash market. And, the major trend to drive fertilizer prices in the long term is that the world is adding about 1-million people per week to its population. We need to feed this additional million per week from the same amount of farmland – so, fertilizer demand will grow. Now, currently, crop prices are growing faster than fertilizer costs, so things do make sense to buy now. To take advantage of the temporarily low fertilizer prices, a Meridian fertilizer bin is your best choice. With everybody forecasting a great crop, are you prepared to harvest it? Are the combine(s) fast enough? Are there enough trucks ready to move the grain to a bin or bagging area? Maybe the ground is wet, so is a grain cart ready to move the grain off the field towards a truck, bin, or bagging area? Is the bagger ready with enough bags? Are the transfers, augers or conveyors able to quickly unload the grain and move it, which allows for the combine to keep moving without having to wait for unloading? Flaman Grain Cleaning and handling has all you need to get the crop into the bank. It seems everybody is forecasting a great crop this year! Now, we can't control the weather, but we can protect the crop from things like fusarium, otherwise it's value will quickly decline. This spraying requires the safe and accurate handling of chemical, and Flaman has what you need to do this. Today's crop assessment map demonstrates a crop developing at higher than normal rates and the complete opposite of last year's lower than normal rates (see below). This confirms the need for a warning by APAS last week when, "The potential for this year's crop to be a record setting event has been confirmed by the Agricultural Producers Association of Saskatchewan (APAS). In a recent press release, APAS issued notice to rail companies to be prepared for what could be a large crop this year. You can see their actual press release here." Is everybody ready for a potentially record setting crop? The potential for this year's crop to be a record setting event has been confirmed by the Agricultural Producers Association of Saskatchewan (APAS). In a recent press release, APAS issued notice to rail companies to be prepared for what could be a large crop this year. You can see their actual press release here. APAS said it's anyone’s guess whether it will reach the record-setting levels farmers experienced in 2013 (38.4 million tonnes, according to Statistics Canada), but either way, APAS president Norm Hall wants rail companies to be ready. “If you remember three years ago when we had the potential of a huge crop, and turned out to be the largest crop on record, the railroads used the excuse that oh, we didn’t know this was coming, we weren’t prepared for it,” explained Hall in an interview with News Talk Radio. So, APAS is asking the railroads to be ready to handle the grain - but they are the end of the system - the system begins with farmers? Are farmers ready to harvest the crop within the small window of opportunity presented by crop development and the weather. And after moving the grain by rail, are the ports and ships ready? APAS has put rail on notice, but what about the rest of the system? Flaman is a Top 100 Small/Medium Employer! Congratulations to our Flaman Grain Cleaning draw winners!